If fossil fuels burn completely, the end products are carbon dioxide and water. Today the carbon dioxide is a waste product, one that goes into the air -- adding to global warming; or the oceans -- acidifying them; or underground -- with as yet unknown consequences. 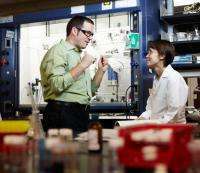 But its not impossible, says Liviu M. Mirica, PhD, assistant professor of chemistry at Washington University in St. Louis, to drive things the other way, turning carbon dioxide into fuels such as methanol or hydrocarbons. Until now reversing combustion has been a losers game, because making carbon dioxide into a fuel uses up more energy than combustion releases and produces more carbon dioxide than it reclaims. But Mirica thinks catalysts might change everything. Catalysts might provide alternative reaction pathways with lower energy barriers. The reactants could then be bumped over those lower barriers with carbonless energy sources such as sunlight. Instead of being a polluting one-way street, hydrocarbon chemistry could circle back on itself and become a clean carbon-neutral cycle, although one that still consumed energy. In the Journal of the American Chemical Society Mirica describes a new metal complex that can combine methyl groups (CH3) in the presence of oxygen to produce ethane (CH3-CH3). This is the second step in the conversation of methane (CH4), the main component of natural gas, into a longer-chain hydrocarbon, or liquid fuel. Miricas team is currently tweaking the complex so that it will be perform the firs step in the methane-to-ethane conversion as well. Fossil fuels are useful because they pack energy in their chemical bonds and release that energy when they are burned. So theyre essentially convenient little energy suitcases. Reactions that release energy, however, are reluctant to reverse themselves and the more energy they release, the more reluctant they are to back up. Theres no way around this problem; if a reaction released energy both going forward and going backward, it could fuel a perpetual motion machine, which, of course, is an impossibility. Still, it is possible to make hydrocarbon combustion reactions run backward -- either by brute force or by finesse. The brute force way is to pump in energy. Thats how the Nazi turned coal into oil during World War II. Saddled with an abundance of coal but short on oil, Germany solved the problem by transmuting coal to oil by chemical means. The finesse is to devise a chemical compound, a catalyst, that takes the reactants up an alternative, lower energy pathway to the reaction products. In effect, instead of going straight up the energy hill, the reaction takes a more manageableideally the minimal-energy-- series of switchbacks to the top. Last year Miricas group was working with a palladium compound that they hoped could catalyze the splitting of water. The catalyst we made for that reaction worked, says Mirica but not as well as we hoped. But we noticed it was easily oxidized, even by the oxygen in air. This was our first hint that this might be an interesting system. So then we asked what else we could use it for. One of our ideas was to use it to turn methane into ethane. Methane, the main component of natural gas, is released in large amounts when an oil well is tapped. Currently the methane from the oil fields is wasted; it is flared off on site, releasing even more carbon dioxide into the atmosphere. 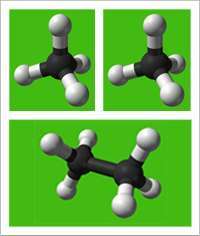 Turning methane to ethane, says Mirica, could be the first step in a process of building longer-chain hydrocarbons such as butane and octane, which would be liquid at normal temperatures and pressures and so could easily be transported to distant users. Miricas metal complex solves half the problem of methane-to-ethane conversion. It takes two methyl groups (CH3) and, in the presence of oxygen and light, binds the carbon atoms to one another to form ethane. The complex consists of an organic molecule that binds a central palladium atom through four nitrogen atoms, holding it like a ball in a glove. The organic molecule is key to the metal complexs function, since it stabilizes it in the unusual +3 oxidation state (it has given up three electrons), which is responsible for its unprecedented chemical activity. Once in the glove, the palladium atom still has two docking spots that can be occupied by chemical species whose reaction it might catalyze. In the reported work, these sites are occupied by methyl groups, which the palladium atom joins to produce ethane. But, Mirica emphasizes, the sites could easily be occupied by other chemical species. Whats more the reactions could be reducing ones (where electrons are donated to reactants) rather than the oxidizing ones (where electrons are removed from reactants) like the methyl-to-ethane conversion. In short the complex opens up a whole new area of palladium chemistry. Miricas lab is currently to tweak the metal complex so that it can peform the entire methane-to-ethane reaction. The first part of that reaction is pulling methyl groups off methane molecules. Thats a bit tricky, says Mirica, because it is hard to break one C-H bond of the methane molecule, which has four C-H bonds, without breaking all four. The reaction wants to run straight down the energy hill all the way to the bottom (CO2), Mirica says. Our goal is to design a catalyst that stops the reaction part of the way down the hill (when only one hydrogen has been removed). His lab is also testing the metal complexs ability to perform a reduction reaction, the conversion of CO2 into methanol (CH3OH). Both the ethane and methanol reactions take greenhouse gases and transform them to liquid or easily liquefied compounds that could then be reused as fuels. If the energy penalty turns out to be low enough the carbon could be recycled in this way many times. Ultimately Miricas goal is a recycling carbon chemistry that requires so little energy that it can run off sunlight. If were going to keep using these carbon-containing fuels that make CO2, we should be trying to make combustion carbon-neutral by using catalysts and the suns energy to convert CO2 back into fuel, he says. Methanol: The fuel of the future?